Sculptor Bob Trotman never knows how people will react to his often off-kilter carved wooden figures. But that sense of uncertainty doesn’t bother the self-taught sculptor. He’s just happy that his art starts a conversation. He recalls a sculpture he started before 9/11 of a man in shirtsleeves sinking into the floor with outstretched arms. To people who viewed the sculpture after 9/11 it looked as if the figure was reacting to that tragic event, but the audience interpretation changed after the financial crisis that shook Wall Street. “It looked like he was reacting to the financial crisis then. It looked like the bottom had fallen out financially, but that was not my intention,” Trotman said in an interview from his home in rural North Carolina. Since starting his career, Trotman has received two grants from the National Endowment for the Arts and four from the North Carolina Arts Council. His work can be seen in the permanent collections of several museums, including the Virginia Museum of Fine Arts, the North Carolina Museum of Art and the Museum of Art and Design in New York. His “Business as Usual” exhibit will run from Sept. 5 through Oct. 31 at the Visual Arts Center of Richmond. The center exhibited Trotman’s “Model Citizens” show in 2002. The “Business as Usual” exhibit features Trotman’s edgy sculptures as well as large-scale studio drawings, sketches and terra-cotta models, all of which are part of his studio process. “We also have some of his studio experiments in fiberglass, concrete and wood,” Wright said. 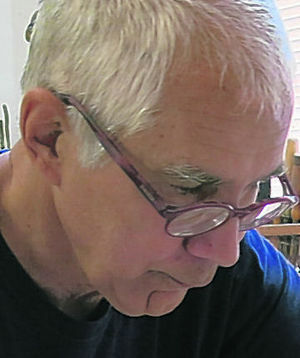 An alumnus of Washington and Lee University with a degree in philosophy, Trotman moved to the small southwestern hamlet of Casar, N.C., in 1974 to adopt a “back-to-Earth” lifestyle. “I wanted to become a craftsman and be my own boss,” he said. For the next 23 years, he crafted furniture. But it wasn’t traditional by any definition. Most of the furniture had characteristics of a human figure. A chest of drawers, for example, was made in the figure of a man in a classic business suit. A table resembled a human figure bent over backward. Those furniture designs were the genesis of Trotman’s current sculptures. “Because I had a lot of the human figure in the furniture, I was making sculptures all along, and finally the sculpture won out,” he said. Trotman’s sculptures vary in size, from 30 inches tall to more than 7 feet. His goal is to create art that suggests “an absurdist officelike arena” that emphasizes corporate power and privilege. The Visual Arts exhibit includes kinetic sculptures with sound and motion, something Trotman started adding in 2010. 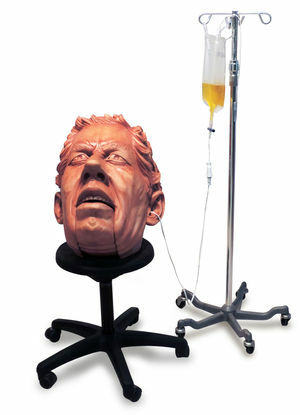 One sculpture in the exhibit, “Slow Drip,” features a larger-than-life man’s head with an intravenous drip running into his ear. The man’s mouth is constantly opening and closing. The stool the head is perched on rotates randomly, giving off a sound that resembles a computer printer. Trotman creates the illusion that the man is talking to the room. “He could be someone in the media, someone that is spreading fear,” Trotman said. The IV drip that flows into his ear contains an unnamed yellow liquid. Wright thinks this show represents an exciting period in Trotman’s career. In addition to the Visual Arts Center, Trotman’s art will be on display from Sept. 13 to Jan. 19 in the “State of the Art” exhibit at Crystal Bridges Museum of American Art in Bentonville, Ark. Alice Walton, daughter of Sam Walton, the founder of Wal-Mart, started the museum. Trotman is one of the 102 artists in the U.S. chosen from a field of more than 1,000 for the exhibit. Even though his art in both exhibits reflects some of his liberal ideas, Trotman hopes it doesn’t come across as preachy.